Studying the correspondence of the men who surveyed the western territories will immerse the reader in times past. I grew up around the four corners, mostly in New Mexico and Arizona and the remnants of these explorers is imprinted in the landscape and in the memories of some of the people. Some may not speak of these times as it reminds them of the harshness of their ancestors, natives and those that came later. The authors of this particular book take their time to allow the men of the Hayden Survey to tell their own story of how they came to this land, met the people, reflected on what they saw, and learned; it is a story that several have tried to put in context, yet have never quite completed. This narration is another attempt to examine the survey of the four corners from the viewpoint of those who were members of Hayden’s team. Compiled from various journal entries, newspaper clippings, and correspondence in chronological order to look at the progress of the survey, the authors take the reader on a journey. The journey begins with the preparations in Washington D.C., as seen through the chronicles of New York Times correspondent Cuthbert Mills (p.37), to the University of Wyoming’s American Heritage Center, which houses most of the artifacts from this survey (p.260). Through these individual and personal entries, we see what everyday life was like on an expedition. For example, E.A. Barber describes grinding corn to make bread near the Navajo cornfields on the Rio de Chelly [Chinle Wash] in Arizona (p.138). 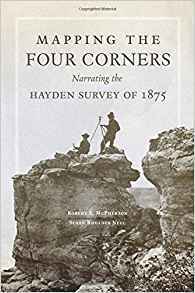 Mapping the Four Corners is different from other western histories discussing the Hayden surveys because it examines a variety of sources to determine what was said and by whom. I would have preferred some part of these narrations to come from the native population, not just the men on the survey. History is richer and more precise when all parties are included. Some of the tales, such as Barber’s description of grinding corn, could be enhanced if the stories from the women he observed were available or if we read about their opinions of the surveyors. Alas, we do not have that history and we are poorer for it. A photo of Ouray, a Ute Chief, is included in the book, along with details about the Meeker Massacre, discussed in the conclusion. There is also a discussion of the growing discontentment between the leaders of the survey: Hayden, King, Wheeler, and Powell (pp. 243-260). Otherwise, this book is a very good history. It belongs in any library that has a Western History program. The maps are good, but color, (especially on the initial map on pp.2-3) would improve understanding for any reader who does not know the geography well. One of many challenges of the four corners region is the geological landscape; one reason this survey met with several unanticipated challenges.